Ladies, it’s time to speak up for your own health! How many times have you downplayed your pain and suffering to be strong for someone else? Innately, women are caregivers. It’s a role that many of us naturally assume. This care and concern for others allows our families to thrive. We often put ourselves last on the list of what gets cared for. Phrases like “I’m good,” even when we are not, are things we commonly say. Question is — how many of us are suffering in silence? How many of us have gotten so used to common female problems like pelvic pain, heavy cycles, and incontinence that we suffer in silence day after day? It’s easy to shrug things off. It’s tempting to downplay our pain. It’s more comfortable to put our needs aside to care for another. Perhaps doing what is routine and practical is not the answer anymore. Perhaps it’s time to end the days of suffering in silence. Just take one glance at your TV or phone. Nowadays, it’s all on the table for discussion. To prepare for your annual OB/GYN appointment, write down the things that don’t seem right. It’s ok to say that you’re in pain or that your bladder leaks or that you avoid certain activities due to heavy periods. It’s ok to say that you have pain during intimacy. It’s ok to be the one who asks for help and receives it. You may only see your gynecologist once a year. Remember, that time is reserved for you. Use it to tell your provider about what’s going on. They want to know so they can help you get back to the things you love to do. Now, more than ever, there are non- or less-invasive treatments for the things that keep you from enjoying every blessed moment. 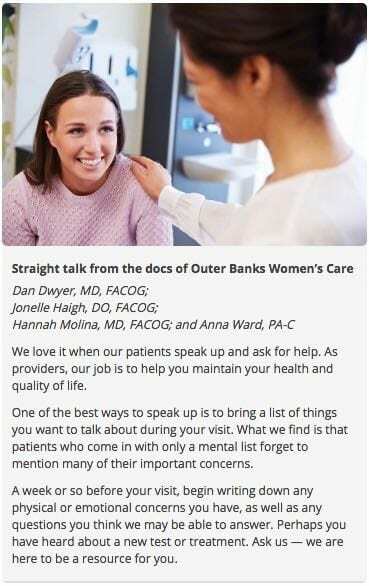 Next time you visit your OB/GYN or primary care provider and they ask, “How are you feeling?” if things are not just right, say so. You’ll find power in your voice and healing that makes you stronger for the ones you love. This survey is open to any resident 18 years of age and older who lives in Eastern North Carolina. Feel free to share with your friends, family members, customers, and clients.